You decide that you’re going to create a website and, after reading David’s post, WordPress, Drupal or Joomla! Which is better in 2018?, you know that your website is going to be in WordPress. Fantastic! But before you continue with your big project, you should know where you’re going… And in particular have very clear what is WordPress, WordPress.org, and WordPress.com. So, to help you make the best possible decision, let me explain all the ins and outs of the WordPress world. Let’s get started! WordPress is a “platform” or Content Management System (CMS) that allows you to create all kinds of websites (blogs, forums, company websites, online stores, etc) with written content, photos, multimedia and much more. WordPress is an open source project. That is, you can run WordPress as you want and for the purpose you want. You can also “see its guts” to learn how it works, change them to suit your needs, or redistribute it to whomever you want. One of the great advantages of WordPress is that, no matter how many WordPress professionals and independent companies make their living with WordPress development or consulting services, WordPress itself is (and will always be) free. And it’s fully customizable and extensible! WordPress has thousands of plugins and themes, both free and paid, that you can install and configure as you like so that your installation is totally adapted to your needs. But what I would like to highlight about WordPress is its community. There’s plenty of professionals and users who use and develop this fantastic platform all over the world. And yes, WordPress is much more than code and developers. 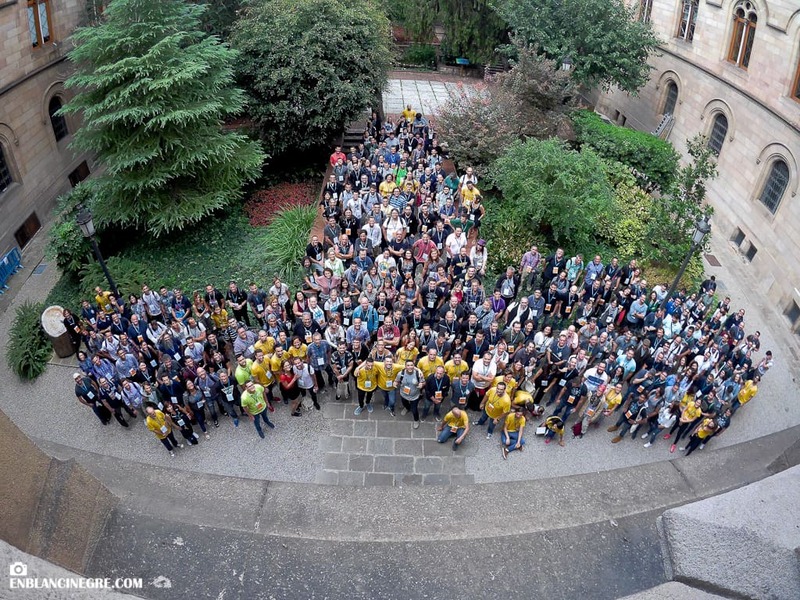 We’re WordPress enthusiasts who love to get to know each other in WordCamps, WordPress Days, meetups and all those events where we can share our experiences… And we loved being involved in the organization of WordCamp Barcelona 2018 that was held a few days ago. In addition, although WordPress is very easy to use, if at any time you have any doubt or problem, you have at your disposal, in addition to its support documentation, the WordPress forums in which WordPress enthusiasts participate and where you can find the solution to your questions and concerns about WordPress. The resources available are incredible! After deciding for the WordPress CMS, you soon discover that this software is distributed through WordPress.org, where you can freely download it in .zip format. If you still have doubts about how to install WordPress, surely you will be interested in David’s post with the 15 things to do after installing WordPress and how to install themes in WordPress. But let’s go back to where we were at the beginning of this section: WordPress.org, as its domain extension suggests, is the website of an organization formed by the WordPress community and is what we all understand as the “real WordPress“. In other words, this is where you’ll find the open, free-to-use, free-of-charge platform that anyone can use. All you need is a domain name and a hosting service to host your WordPress website so that you become the sole owner of your website and its content. To ensure that your website design is just what you need for your readers, in the WordPress.org themes directory you have more than 3,500 free themes (some prefer to call them templates) with a GPL license that you can install and customize on your website. But you can also buy premium themes from online stores such as Themeforest, Template Monster, Elegant Themes, Studiopress, iThemes … or even design your own theme! If you want to know a little more about this topic, David explains everything you need to know about WordPress themes. In order to ensure that there is no lack of functionality on your website, in WordPress.org you will also find more than 57,000 free plugins that you can download and install on your site to have absolute control of it. It’s difficult to have a need for which you don’t find a plugin to help you solve it. The main problem with so many plugins at your fingertips is that sometimes it is hard to find the best alternative according to your needs. This is why in this blog we have written several articles of the best plugins that can help you in certain cases: to position your blog, to manage your media library, for social networks, to create contact forms, among others. We strongly recommend that you install Nelio A/B Testing and Nelio Content if you want to ensure that your content is the preferred content of your readers and you promote it easily on your social networks. Nelio Content is a WordPress plugin that allows you to automate the promotion of your blog on social networks. As with themes, a large majority of the plugins offered for free on WordPress.org have their premium version with which you can have more functionality and your website easily can become a site with a professional image impossible to imagine if you wanted to develop it from scratch. Yes, they are not free and you have to pay, but thanks to that, plugin developers can earn a living and at the same time offer free products and support to the WordPress community. Now it’s WordPress.com‘s turn. In this case, as its extension “.com” indicates, we are talking about a company’s website. The company is Automattic and its founder, Matt Mullenweg, is the one who originally created WordPress. Automattic, in addition to owning WordPress.com, also owns WooCommerce, Jetpack, Simplenote, Longreads, VaultPress, Akismet, Gravatar, Polldaddy, Cloudup, and more plugins and services around WordPress. They also contribute both financially and in resources to the WordPress community, ensuring that WordPress.org is what it is. In fact, Matt still makes and oversees a large majority of decisions about changes to the WordPress core or the WordPress.org directory. Automattic is the company founded by Matt Mullenweg. But let’s go back to WordPress.com. WordPress.com is a company that offers a comprehensive service for you to have your own website. It offers a WordPress hosting service with 5 plans: Free (free but quite limited), Personal ($36 per year), Premium ($99 per year), Business ($299 per year) and VIP (starting with $5,000 which includes a totally personalized hosting, design, development, support and marketing service). The advantage of the free plan is that with it you can easily have a WordPress web created with 3GB of space. With this service, you don’t have to worry about updates or backups because they take care of everything. And when you need more space, you can always switch to higher plans (Personal up to 6GB, Premium up to 13GB, or Business for unlimited space). The domain of your website will be of the type https://the-name-you-want.wordpress.com instead of https://the-name-you-want.com (unless you pay, of course). The free plan is not exactly that free. On your website, you’ll have a space reserved for ads, which are added by them and therefore don’t help you earn anything. Only when you go to the Personal plan can you remove their ads. And you won’t be able to place your own ads or install AdWords. You’ll only be able to do this when you have the Premium and Business plans. Also, you can not install plugins. Only when you have the Business plan will you be able to install plugins from a set that they have pre-selected. And only with the VIP plan will you be able to install the plugins you want (remember, this plan starts at $5,000 a month). And in the same way, you can’t install custom themes either. With the free plan you have a small set of themes to select the one you want and with superior plans, you can select Premium plans. But in any case, the options for customizing them are quite restricted. If you like to have absolute control over what happens on your website, forget about it. You can not install Google Analytics or any other tracking platform unless you are already in the Business Plan. Nor do they offer you typical shop functionalities such as payment gateways. And finally, if you don’t pay for the Business Plan, your website will show the link that has been created with WordPress.com. Oh! And WordPress.com is a website blocked in China. If (some of) your readers are in this big country, you’ll have to look for a different solution, because this one won’t work for you. But again, if all you want is for your website to be a blog in which you can share posts on a particular subject without great commercial aspirations, WordPress.com can be an easy alternative to start. And, rest assured: if at any time you want to change to WordPress.org, you can do it easily. In WordPress.org you’ll find the free WordPress software to create your web as you want. You’ll need to get a hosting service and a domain name. And like any DIY alternative, at first it might be a little bit more expensive, but you’ll have the freedom to do what you want with your website and fully customize it to meet your needs. With WordPress.com you have a pre-set solution that works out of the box, saving you from the hassle of looking for appropriate hosting service, configuring a WordPress site, and so on. This is less flexible, of course, but it’s great to get started. Featured image by Loren Gu in Unsplash.